EXPIRED!!!!! Matilda Jane Clothing Giveaway: Win a $50 Gift Card! WE HAVE A WINNER!!!! :) There is a screenshot down below of the number generated!! There are a few pictures in this post to give you a sense of the Matilda Jane style. You can also view their “Lookbook” or the “Shop the Collection” section of their website to see more. Sizes range from 6M -14 Tween for girls, and for adults: XS-XL. This clothing line is only available through in-home Trunk Shows, but as luck would have it, I happen to know one awesome trunk keeper! Arrington Howard is the trunk keeper for the Raleigh, North Carolina area, but you can order through her even if you don’t live in Raleigh! Arrington (isn’t that the prettiest name?!) 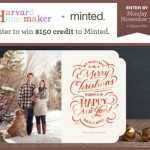 has been so sweet to offer one of my readers a $50 gift card toward anything that Matilda Jane carries. Thanks again to Arrington for offering this great giveaway. Please email her with any questions or if you would like to make any future purchases. (Remember that you cannot purchase directly from the Matilda Jane website.) She is the best!! When we had professional pictures taken recently, Arrington totally helped me outfit two of my girls–they are down below, head-to-toe in Matilda Jane! “Amelia’s Mommy”… you win!!! Lucky Number FOUR! See more information below, including how to contact Arrington if you’d like to place a Matilda Jane order! Thanks for entering, everybody! And don’t forget to contact Arrington if you want to do any Matilda Jane shopping!! She’s truly an awesome trunk keeper to work with, and she can help you no matter where you live! IF YOU’RE NOT ALREADY FOLLOWING MY BLOG, PLEASE CHOOSE AT LEAST ONE OF THE OPTIONS BELOW TO JOIN THE FUN! THIS WILL GIVE YOU YOUR PLACE IN “LINE” AND ENSURE THAT I HAVE A WAY TO CONTACT YOU IF YOU WIN. * You will need to log in if this is your first time leaving a comment. This is to protect the site from spammers. The next time you visit and leave a comment, you will be remembered, so you shouldn’t need to log in again. Easy! If you are loving the Matilda Jane line, please consider adding yourself to Arrington’s distribution list. She will make sure you’re aware of sales, new launches, etc. Please email her if you’re interested. She’s so great to work with!! Easy enough!! Good luck everyone! * US residents only. Must be 18 years of age or older. Sorry! * You may enter only once. The winners are determined by the order in which comments are left. If randomizer.org generates the number 1, and you left the first comment, you win! * This giveaway expires at 11:00 pm on Friday, February 1, 2013. Time determined by my computer. :) No more entries after that point. * No purchase of any kind is necessary. 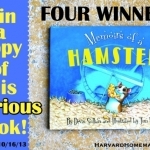 * Neither Harvard Homemaker, nor anyone who lives in her household (husband/daughters), may enter this contest. * Good luck! I will put the winner in touch with Arrington Howard, and she will help you make your fun purchase!! 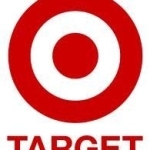 $100 Gift Card to Target Giveaway has EXPIRED!!!! Winner listed below! 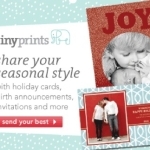 Tiny Prints $50 Gift Certificate Giveaway--EXPIRED! Winner: h35champ! 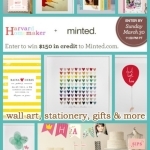 Giveaway - Win $150 to Spend at Minted! EXPIRED!! !